LIBS stands for "Laser Induced Breakdown Spectroscopy". 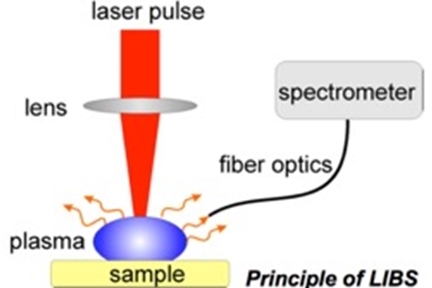 With this laser spectroscopic method, it is possible to determine the atomic and, with limitations, also the molecular composition of a sample. The LIBS analysis method has a wide range of applications in research, safety engineering, environmental analysis and industrial process control. The basic principle of the LIBS is very simple: a very short, high-energy laser pulse is focused on a surface to be examined. The high power density in the focus leads to strong heating of the material of typically some 10,000 ° C. The high temperature causes the formation of a light-emitting plasma whose emission is characteristic of the respective material. The radiation emitted by the plasma is fed via an optical fiber to a spectrometer for analysis. A particular software enables the fully automated evaluation of the information. 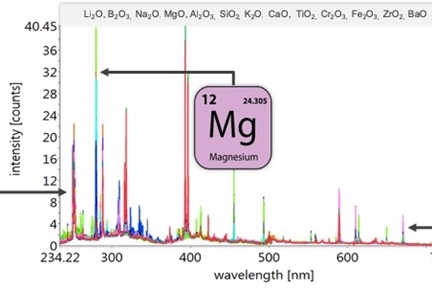 The measurement of the intensities of individual spectral lines of different elements allows conclusions about the atomic composition of the sample. The spectrum thus recorded can be used as a fingerprint ("1st order fingerprint") of the material and used for identification or elemental analysis by comparison with the data of known substances. 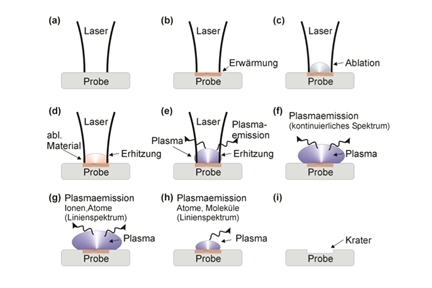 In addition to this spectrum of intensities, the analysis of the temporal behavior of individual emission lines ("2nd order fingerprint") also provides information about the molecular structure of a material to be analyzed. This is of particular interest for the analysis of polymers, biological samples and explosives, since these consist for the most part of the elements carbon (C) hydrogen (H), nitrogen (N) and oxygen (O). While the LIBS intensity spectra of different substances of these classes differ only slightly from one another due to the similar atomic composition, a classification becomes possible by adding the time information. LIBS measurements can be performed online, onsite and in-situ. SECOPTA’s LIBS devices are based on highly stable compact lasers and automated analysis algorithms. They are well suited for industrial applications.